In order to determine the force output of the cylinder, square the bore size, multiply by pi (3.14) and divide by 4. The resultant is the bore cross-sectional area, or simply “area of the bore”. Next multiply the area of the bore by the operating pressure. This is the force that the cylinder can produce on its extend stroke. Since hydraulic systems run at much higher pressure than pneumatic systems, cylinder bores tend to be much smaller for significantly larger force outputs. For instance, a 12” bore pneumatic cylinder will produce just over 11,000 lbs. of force at 100 psi. Contrast that with a 2-1/2” bore hydraulic cylinder running at 3000 psi, and it produces almost 15,000 lbs. of force. While a 2-1/2” bore hydraulic cylinder may be smaller and less expensive than a 12” bore pneumatic cylinder, consideration should be given to the overall system in which the cylinder will be used. In most shops, there is already an air line with 100 psi that can be used to operate the pneumatic cylinder, but if a hydraulic cylinder were to be used, a whole system of pumps, valves, tanks and hoses would need to be installed if it is not there already. The bore size is a critical step in the cylinder design process that will help in the rest of the cylinder design. It narrows down what piston rod sizes will be available, as well as what the overall size of the cylinder will be. 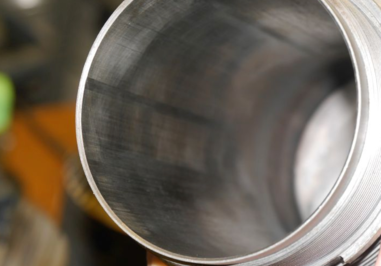 Talk to a Sheffer Engineer today to determine the best bore size for your project!